September 12th-15th, 2015 – New York, Vermont, New Hampshire, Maine, New Brunswick, Prince Edward Island – New Plans! Fall colors are late this year and Maine isn’t far enough east. So I am bound for the Maritime Provinces of Canada, then coming back for the fall colors. When I was in Alaska I decided I should go to Key West, mostly because it was as far as I could go, and that tickled my sensibilities. But then someone said I shouldn’t miss the fall colors in Maine. Seems reasonable that I would go there first as the colder weather starts to arrive in the north. So that is where I’ve been heading. Now that I’m within striking distance, the fall colors are unseasonably late this year. So rather than hang around waiting (which I don’t do well), I got a bit of a geography lesson and am planning to head out to the Maritime Provinces of Canada. If you had asked before this trip how much further east can you go than Maine I would have said, “none”. But that is entirely from having the outline of the USA being drawn without Canada attached. You can go another 700 miles east as the crow flies in North America. So, I’m heading east through Vermont, New Hampshire, Maine, then into New Brunswick Canada. I have an idea that I will visit Nova Scotia, and Prince Edward Island, but whether I will take the boat out to Newfoundland I hadn’t decided at this point. The idea is growing as I look at the map, but lots of unknowns to get filled in on. I’ve really only had more than a basic idea of where these places are for a couple of days. After leaving Watkins Glen New York I followed the back roads through to Vermont. I ended up at Woodford State Park for the night. I arrived late and met the ranger while doing self-check in. We had a very nice chat, he was familiar with Washington state having worked in a park there previously. The site was nice and the showers were pleasant, and as late as it was no worries about sharing the facilities. 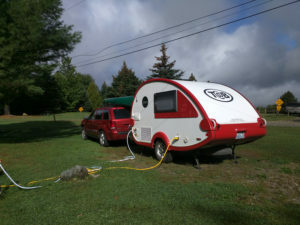 From here I traveled across Vermont and New Hampshire into northern Maine, and landed at Skowhegan and the KOA there. Seems this is a winter sports destination. Along the way I stopped at a couple of visitor’s centers and grabbed info about places to visit on my way back through. There was a lot of effort being put forward to help folks avoid collisions with Moose and the like. Moose being as large as they are present a particular danger. Not just because of their mass, but because they are tall, so they are likely to end up coming over the top of the hood. 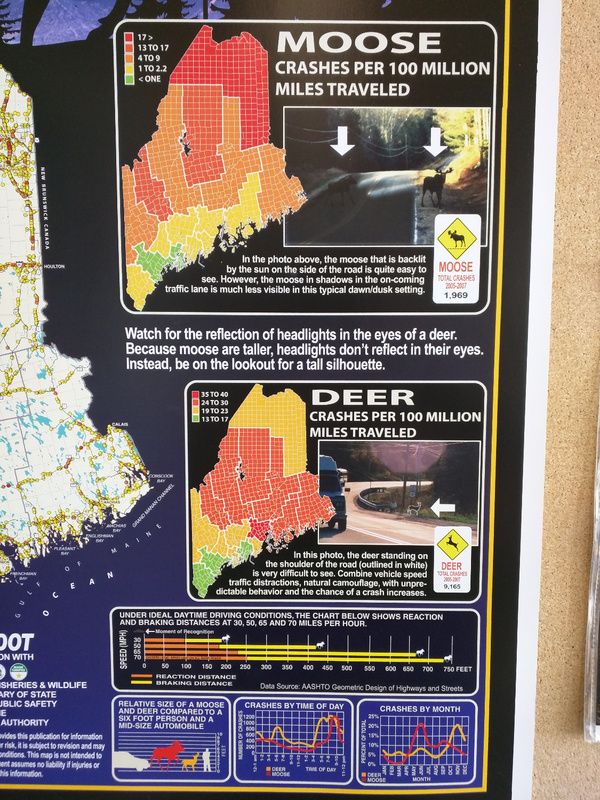 One poster provided statistics about when collisions spike by time of day and year. Another poster showed a picture of a road with a moose clearly standing in the middle of the road. What was difficult to see was the other moose, standing in the other lane in the shadow of trees. A very common back road scenario. Speaking of Moose and posters. 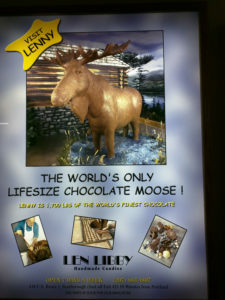 An advertisement that I saw several times suggested that you come visit “Lenny” the world’s only lifesize chocolate moose. No I didn’t misspell moose here. Lenny is apparently 1,700 pounds of chocolate. “Ten minutes from Portland”. Alas I never made it to see Lenny. But one thing I saw plenty of was “world’s largest” things. Next stop back to Canada and the land of no cellular service or data. Thanks again AT&T. I arrived at the border crossing at Calais/Saint Stephen in the afternoon and had an easy crossing, most of the talk being about the trailer and my trip. Those business cards come in handy. Over the border I headed into Saint Stephens to the visitor’s center which on the water through town. I needed some help locating a good place to stay for the night. When I found one and showed up there they were just about to close. I was a little confused, because I thought it was 4pm, but it turns out I was wrong. The one thing I didn’t count on was losing another hour! I didn’t realize that there are two more time zones as you head east. This one is Atlantic Time (UTC-4:00), and when you get to Newfoundland they go another half hour (UTC-3:30). What this meant was that I had effectively started an hour later this morning, and it was already approaching 5pm. The folks there were kind enough to explain this, and help me pick some options. I headed for New River Beach Provincial Park, and arrived just in time to get checked in. The sites have power here, and not expensive. I got a spot right across from the very modern facilities and once again enjoyed nearly private use of them. The next day I headed out, the highway that follows the shoreline joins up with the Trans-Canada highway a few miles up. Just about where they meet is Lepreau Falls. I stopped for a quick look around. 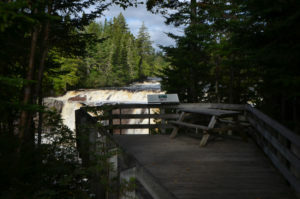 Very scenic with picnic tables on decks secluded in the forest, and a view point for the falls. From here I got on the smooth and easy Trans-Canada highway and headed east. In Moncton I had to make my final decision about whether to visit Prince Edward Island before I headed further east or after. First, I found a lube place for the Jeep. 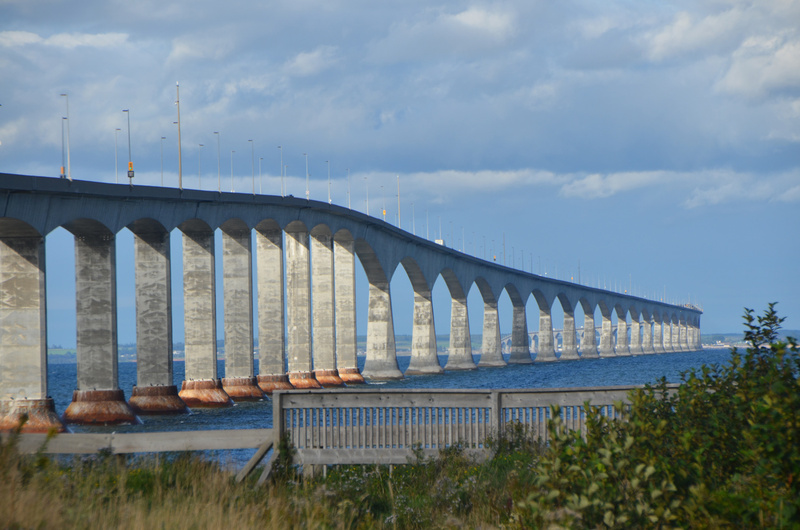 Then, I decided to visit Prince Edward Island first, so north to the Confederation bridge. 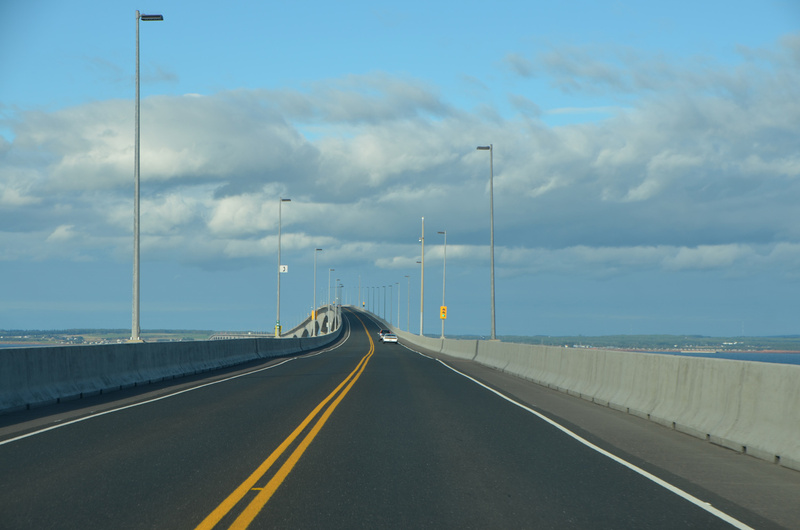 The Cape Jourimain National Wildlife Area has a nice nature center building at the New Brunswick end of the Confederation bridge. Worth a stop, whether you are interested in the wildlife, the bridge or just looking for information. The staff were quite friendly and helpful. The 8-mile-long bridge leads from mainland New Brunswick over the Northumberland Strait to Prince Edward Island (PEI). The bridge has a toll one way. You can drive onto the island for free, but it will cost you $46 to leave. 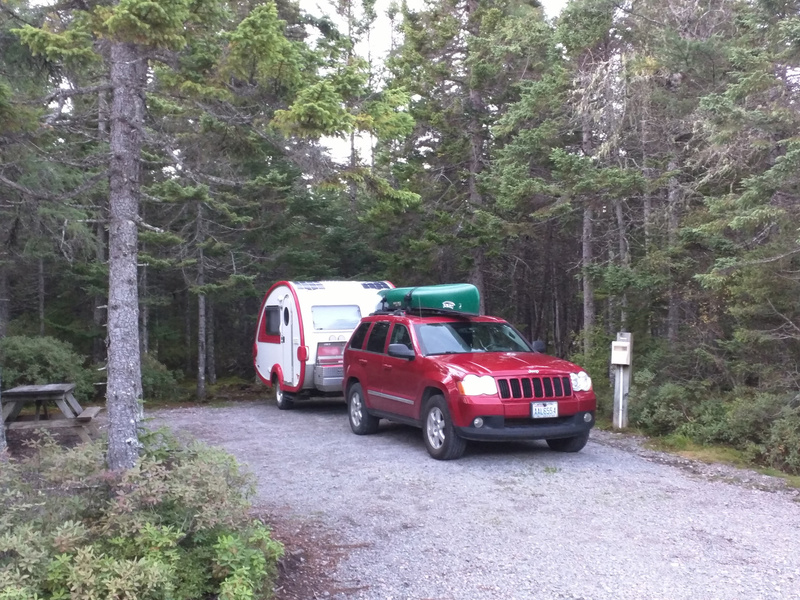 I ended up at the Charlottetown KOA for a couple of nights. Very nice and quite central. They had lots of stuff to entertain the kids, including an RC car racetrack and cars to rent. 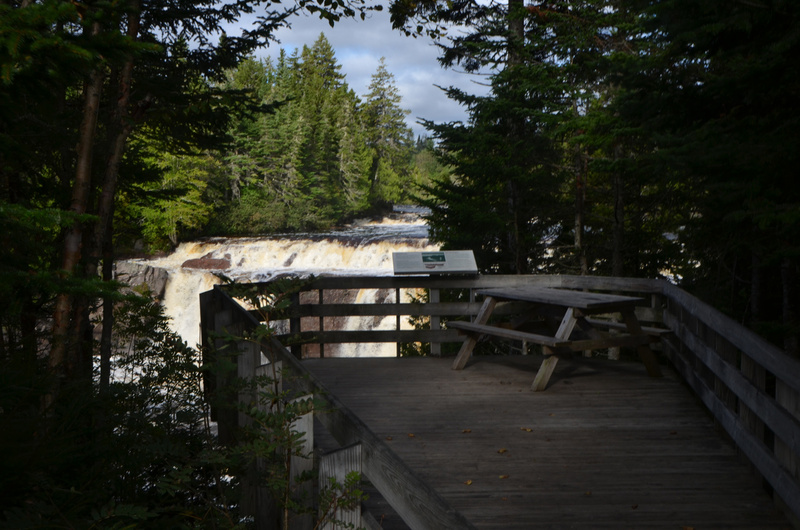 Lepreau Falls – View secluded picnic table from where I parked the trailer. Looking back at the trailer.